The above screenshot introduces the Home Panel, which serves as a starting point for the Twenty/20 Views application. Here, the contents of the Home overview ‘Manual’ are displayed thereby providing short descriptions of the various supported panels. From this Home panel the user may ‘launch’ any panel of interest by clicking on that panel’s name as listed in the Navigation Panel. The above screenshot shows the contents of the Standard ‘View’ of the By Order folder object, which is the object associated with the By Order ‘Folder’ of the Customer Orders ‘Folder Group’ of the Grid View ‘Panel’. The associated data is presented in tabular form and represents a hierarchical view of customer orders. Displayed data represents rows associated with the Orders table, which is the ‘root-table’ of the By Order folder. Expansion of a row’s node exposes the contents of the ‘Child-Table(s)’ of the ‘Parent-Table’ (root-table in this case). User may select a View from the list of available views to make that view the Current View. All formatting properties available to the selected view will be applied to the display. 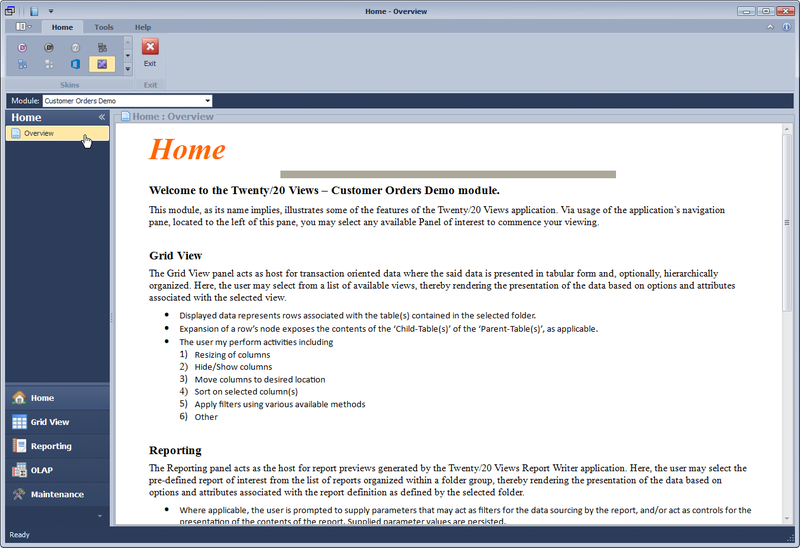 The above screenshot shows a variation of the Standard ‘View’ of the By Order folder object as displayed on previous page. Here, the node of the row representing Order ID 24011 is expanded to reveal the contents of the associated Order Detail (child table) rows. Row showing totals associated with the order details is displayed. Nodes of the Order Details table may be expanded to reveal associated child table rows. The above screenshot introduces grouping by ‘Smart’ dates (emulation of the date grouping interval found in Microsoft ® Outlook). Here, orders required dates are logically grouped into intervals based on their relationships with today’s date. Via the group header context menu, the authorized user may select from any of the supported group intervals and cause the displayed rows to be grouped by that grouping method based on the value of their required date column. Note the filter (near the bottom of the image) that is applied to limit the orders displayed to those having required dates falling within a given period. The above screenshot shows a page of the Stock Status report, which is the object associated with the Stock Status ‘Folder’ of the Daily Reports ‘Folder Group’ of the Reporting ‘Panel’. The associated data, which represents the Suppliers and Product Categories, is rendered as a printer-ready report and presented via the Report Print Preview form. The Document Map (table of contents) feature of the Reporting panel’s Print Preview form is also introduced here. 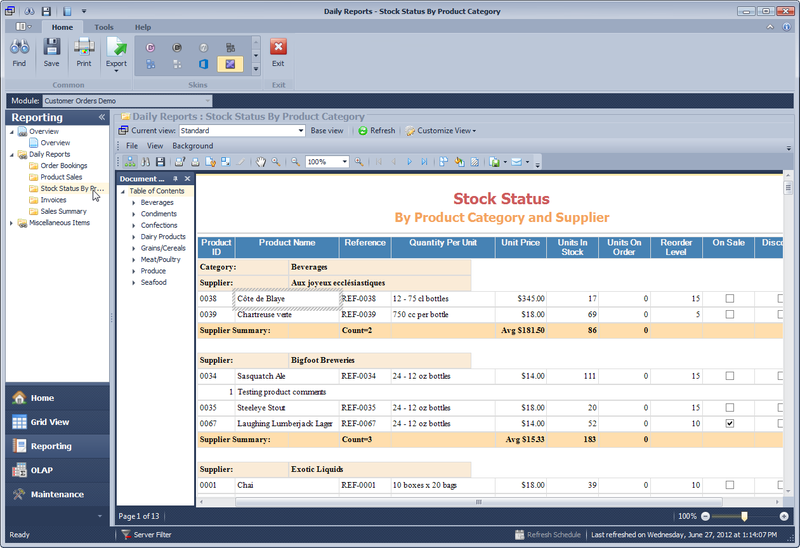 Subject (text) lines representing the Suppliers and Product Categories in the referenced Stock Status report are hierarchically organized in a Table of Contents thereby realizing the document map effect. Use the report’s ‘Find Panel’, or (where available) use the reports ‘Document Map’ to locate specific text within the report. Choose to Save the report’s contents to media, and or Export the report’s contents in any of the supported formats. Iterate through the report’s pages as well as zoom in/out on the focused page. The authorized user may open the report editor to perform desired updates to the report’s definition file. Expand/collapse the represented groupings to reveal/hide their contents. Select the entry of interest to ‘browse’ the page of the displayed report that contains the selected entry. 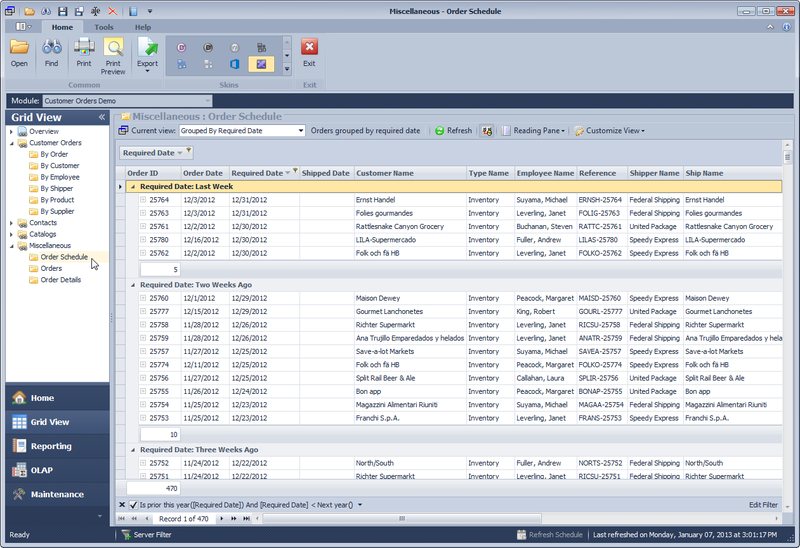 Hide the document map panel itself when the occupied space is needed for the expanded display of the report. The above screenshot introduces Report parameters which are used to provide filtering for the data contained in the resulting report, as well as options for managing the report’s output. Here (in this example), the desired invoice date range and an Invoice ID (partial) are used to limit the contents of the report. 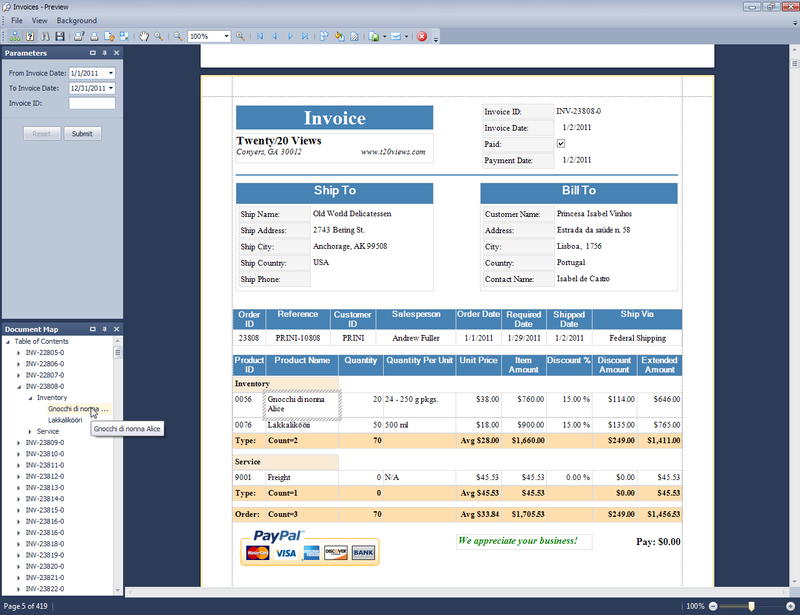 The Invoices Report, contained in the body of the report print preview form, represents a typical invoice. The above screenshot shows the contents of the Top N Values object, which is the object associated with the Top N Values ‘Folder’ of the Sales ‘Folder Group’ of the OLAP ‘Panel’. 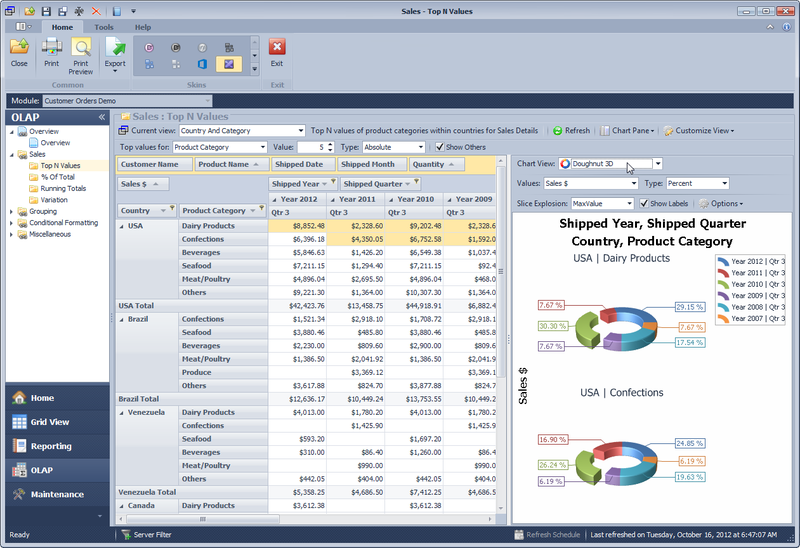 The associated data is presented via a Pivot Table (or Pivot Grid) form and represents a Cross-Tab view of summarized customer orders (shipments). Displayed data represents Sales during the 3rd quarter over years 2007 through 2012 for Product Category, within Country. Data is filtered to display only orders having Shipped Date other than null (indicating that they have indeed been shipped. Top Values filter of 3 has been applied to the Country field to restrict the displaying of rows to the top 3 country values (Sales $). Top Values filter of 5 has been applied to the Product Category field to restrict the displaying of rows to the top 5 product category values (Sales $). Type is set to Absolute to so that the top value computation is based on absolute values as opposed to percentages. The Show Others option is checked to cause values representing Countries (, and Product Categories) that fall below the top values threshold to be grouped as ‘Others’. The alternative is to exclude those values from participation. Move fields among Filter Area, Data Area, Columns Area, and Row Area. The above screenshot introduces Charting integration, where the attempt is made to visualize data contained in the Grid via the user’s preferred chart view. Via usage of menu option, choose to display or hide the Charting Pane. The charting pane may be displayed to the bottom or to the right of the grid. Choose from the list of supported chart views. Elect to hide or show value point labels. Elect to enable or disable crosshair features. Elect to rotate chart contents (3D chart views only). Choose the type of column or row that should participate in the visualization. The above screenshot expands on Charting integration as introduced on the previous frame. Here, the chart is positioned to the right of the grid, and is presented in the Doughnut 3D chart view. 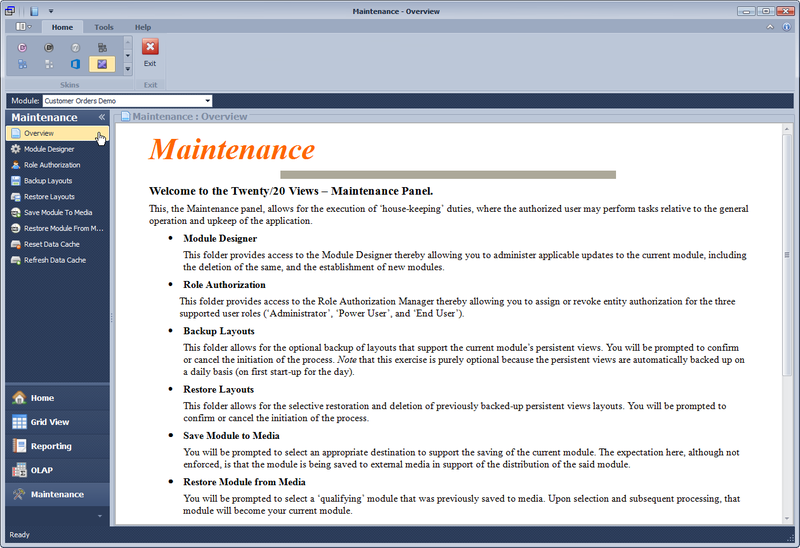 The above screenshot shows the contents of the Maintenance overview ‘Manual’, which provides short description of each of the items contained in the Maintenance navigation panel. 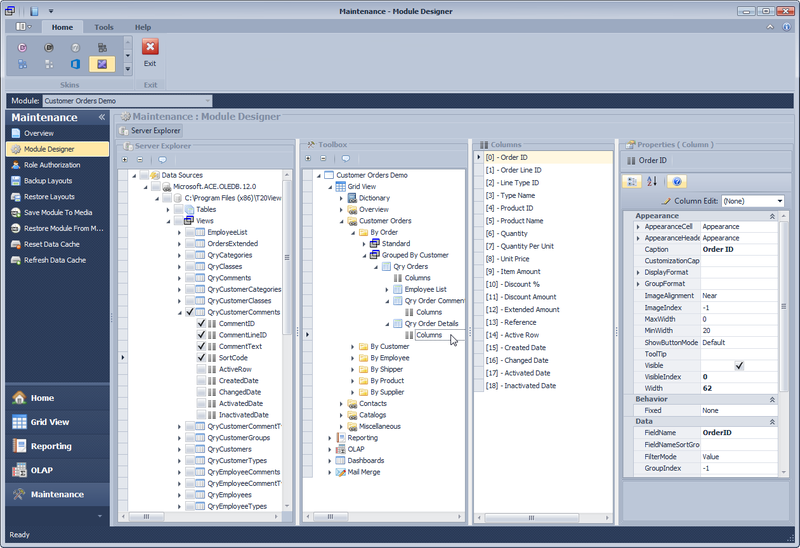 The above screenshot introduces Module Designer via which Modules and their contained objects are established and maintained. Define the module and its data connection properties. Define Folder Groups for each supported Panel Type. Define Folders for the folder groups. Define the Standard View for the folder. In the case of the Grid View panel type, define (select from the data source) the view’s root-table, child tables, as well as the relationships among the defined tables. In the case of the Reporting panel type, define (select from the data source) the view’s root-table, child tables, as well as the relationships among the defined tables. You’ll then utilize the Report Creation ‘wizard’ to define your report by assigning the appropriate report band type to each of the related table comprising the view. In the case of the OLAP panel type, define (select from the data source) the view’s ‘root-table’, and assign contained fields to the pivot grid’s Filter, Data, Column, and Row areas as desired. Access the Text Editor to maintain the module’s text properties. 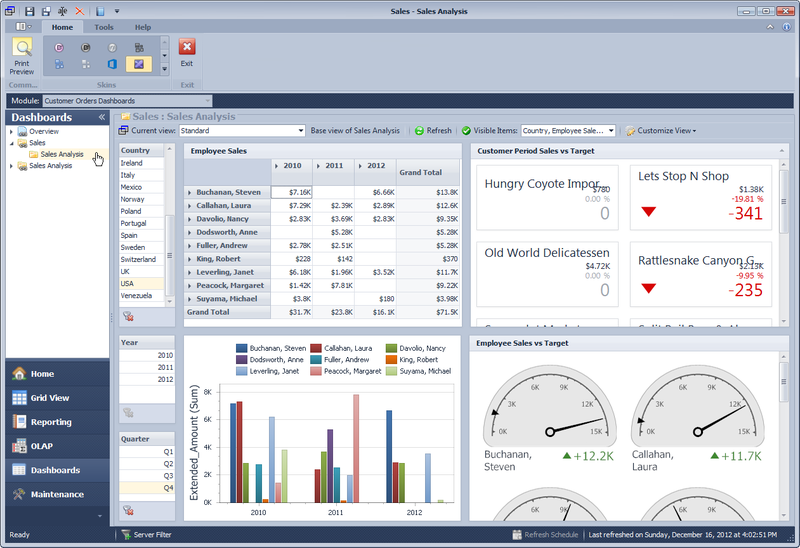 The above screenshot introduces the Dashboards panel which is utilized in the user configurable presentation of data in a variety of item styles in any desired combination, and along with the usage of its ‘master filter’ feature, attempts to satisfy Analytics needs. 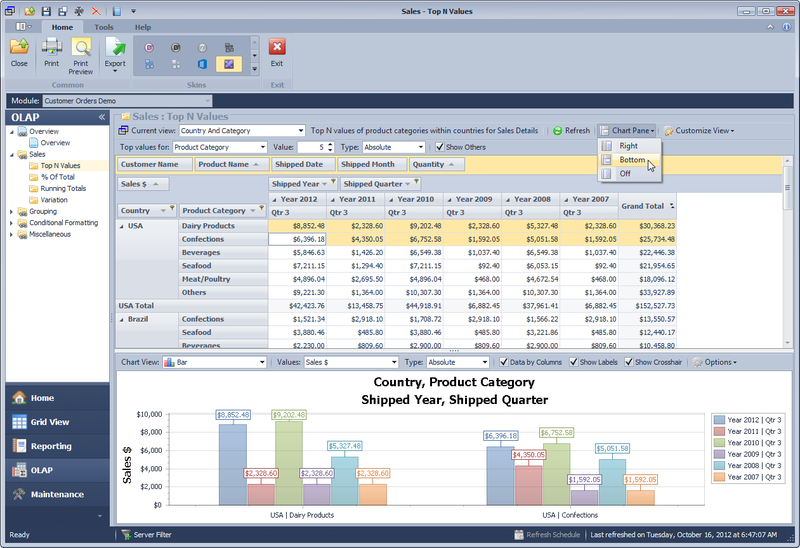 Here, various dashboard items are utilized in the visualization of sales for given periods. On the left of the content area there are three grid items (Ship Country, Order Year, and Quarter) which act as filters for the other items. 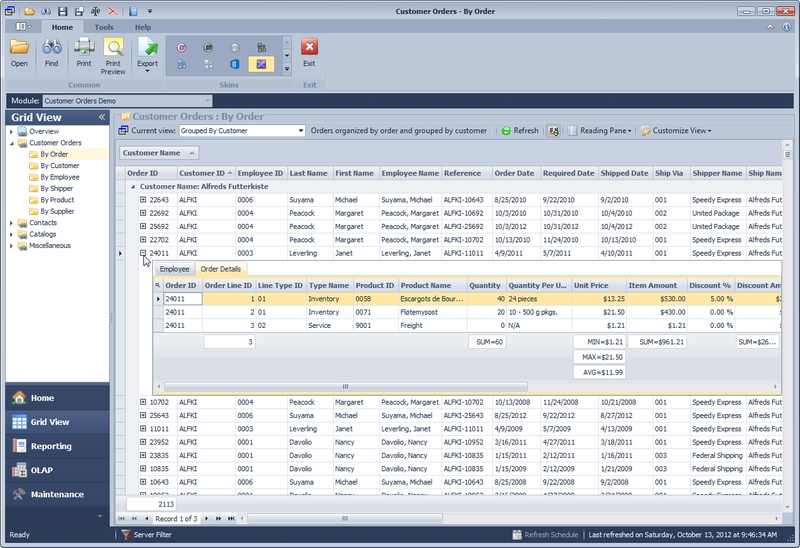 Employee Sales uses the Pivot item to summarize sales for each employee over time. Drill-down to the customer is available from each employee, as well as to each quarter from each period year. A Bar-chart element is utilized in the visualization of the Pivot item contents. Customer Period Sales vs. Target uses a Card List item to detail each customer’s sales and shows a comparison (difference) against targeted amounts. Employee Sales vs. Target uses Gauges item to detail each Employee’s sales and shows a comparison (difference) against targeted amounts. Amounts are expressed in thousands (“k”), unless that amount evaluates to less than a thousand.